We can say with confidence that we’ve never had an issue quite like the March 2016 issue. 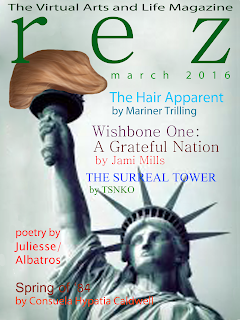 It is a great coup that Mariner Trilling (whom you know for his wonderful poetry that we’ve had the privilege of publishing) has scored an interview not with Donald Trump, but with his unpredictable hair! As you might imagine, the unimaginable happens in The Hair Apparent. Jullianna Juliesse contributes Surgery of the Soul, a difficult but deeply rewarding poem about survival. In a first for rez, Chris Mooney-Singh (aka Singh Albatros) not only brings us two wonderful pieces, but allows us to link them to audio files where our readers can hear him recite each piece in compelling fashion. The first piece is a short poem, Chain Gang Ant, which adds to our view of the lowly ant, going about his business. Jami Mills’ sci-fi thriller, Wishbone One, continues with the fifth installment, A Grateful Nation. Finally, our protagonist escapes the bounds of gravity with Grace, his always complicated and perplexing AI. The Still Not Known One (TSNKO) picks up where Art Blue leaves off with The Surreal Tower, which further explores themes we’ve grown to love so much: reality and the future. Consuela Hypatia Caldwell, who has graced our pages with her stunning work several times before, takes us to the white water of the Colorado Drainage in Spring of ‘84, where she reminisces about her earlier life as an expedition leader. You will feel the spraying water on your face and the churning river below your neoprene raft as Consuela brings the river alive. And closing this month’s issue is Singh Albatros’ second piece, a brilliant fable, Sleeping With Angels, also with an audio track link. We’re grateful for all of our blessings this month, and we hope you enjoy reading this wonderful issue.